Chapter 3 Life ‘down the line’. Chapter 4 The War years. Chapter 5 The End of an Era. Chapter 6 Tales from the Bungalow. I have just finished reading Down The Line and would like to say how much I enjoyed it. I find the history of the Plotlands fascinating and would have loved to have experienced life there. Thank you for publishing this plotlands history for all to read on the website. The children described in the book would be about the same age as my own mother. What dedication for Allan’s father to build a whole bungalow single handed. How skilled to have made the formwork for the concrete surrounds to the front door. What about the intricate woodwork over the door, so typical of the era, Lansbury was a truly beautiful little bungalow. The trips to Laindon from Barking, then changing trains (possibly to avoid the Tilbury line) to travel on to Laindon Station, so familiar. We used to change at Upminster when travelling on the District line from Becontree after returning to visit Nan at weekends in our early days in Laindon in 1957. 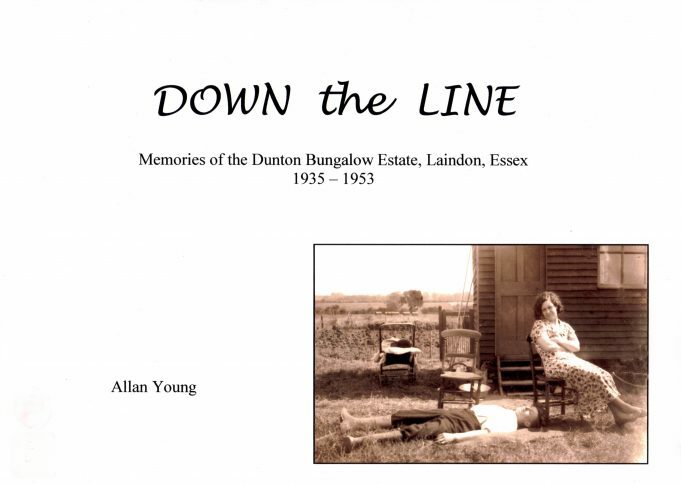 The parts of this article about the summer days bring back my own, slightly different memories of Laindon, albeit at a later date, fascinating all the way through – a brilliant piece of factual writing indeed. Even the trips to Southend seem part of my own childhood. I have a photo of my own Nan and Grandad sitting in deckchairs probably in that same prewar period Allan has described.